Each of the recipes included in this collectible cookbook have been voted "2012 Members' Choice" favorites by members of the Just A Pinch Recipes... a tasty honor indeed. With 100 recipes, 80 featured home cooks and 7 delicious chapters, this cookbook is jam-packed with heirloom quality eats! 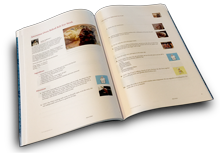 Order a professionally printed, perfect bound cookbook with a full color glossy cover and 100 recipes. Congratulations to all of you great cooks for your recipes, and for being featured in this great book !!!! just viewed this awesome cookbook. alot of wonderful reciepes placed in this book. "BRAVO" to all cooks that were featured. Looks great want to get a little pricey will have to wait. P 123 Oreo Cookie Fudge Bundt Cake...How did I miss this one too? Looks fantastic. I would love to buy it but its a bit pricey for me. I have tons of cookbooks. However, this is one I will have to buy! Such unique recipes and love the pictures! Congrats to you all. This has been a great site. Just love all the sharing!! Annette, you are welcome! Nice to see you also! Thanks Cheryl. Good to see you! Congratulations to everyone that was featured in the 2012 cookbook! I voted every time I made one of your delicious recipes! Gotta have a look at the book!! I have tried several recipes and they have all been delicious!